An RAF doctor has told a jury that the G-force felt by pilot Andrew Hill before he crashed and killed 11 men was no greater than a fairground ride. 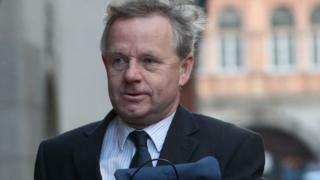 Wing Cdr Nicholas Green, who teaches RAF pilots about the effects of gravity, said the G-force experienced by Mr Hill at the Shoreham Airshow was "a lot lower" than air combat training. The Old Bailey earlier heard that Mr Hill's judgement may have been impaired by a lack of oxygen caused by G-force. He denies 11 counts of manslaughter. The ex-RAF pilot crashed a Hawker Hunter jet on to the A27 in Sussex on 22 August 2015, killing 11 men. Mr Hill would have felt a force above 4G for about three seconds, with a maximum of 4.8G, the jury heard. Wing Cdr Green said: "We don't get concerned until G levels are sustained over four seconds. "In a fairground ride you can go up to 5.5G for a short time. The G we are dealing with here is relatively low." Dr Henry Lupa, who advises the RAF and Nasa on G-force, yesterday told the jury that Mr Hill may have been suffering cognitive impairment as a result of cerebral hypoxia. He said that "measureable hypoxia can occur at levels significantly below" those that cause a loss of consciousness, known as G-loc, or a lesser condition known as A-loc. Wing Cdr Green said this "does not match what we see when we expose people to G". "They are functional until they are not," he said. "We don't see slurred speech, a sort of wooziness. It's quite black and white." Mr Hill, 54, of Sandon in Hertfordshire, denies 11 counts of manslaughter by gross negligence.